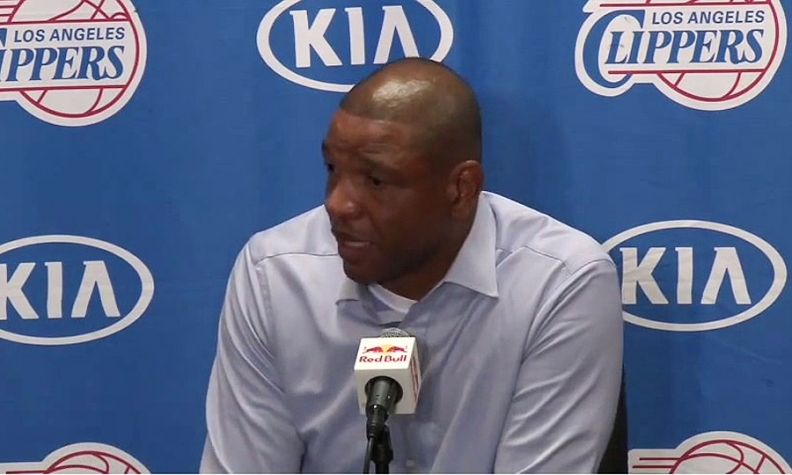 Clippers coach Doc Rivers, pictured earlier this month, said today he will wait and see about his future with the NBA team, which has lost Kia and other corporate sponsors. Kia Motors America, Mercedes-Benz dealers and CarMax are among corporate sponsors abandoning the suddenly toxic Los Angeles Clippers of the National Basketball Association following racist remarks allegedly made by the team's billionaire owner Donald Sterling. CarMax, the chain of used-car superstores, was the first Clippers sponsor to jump ship on Monday. The company told ESPN it finds the alleged statements about black players and celebrities attributed to Sterling to be "completely unacceptable." The company had been one of the club's longest-serving and most loyal corporate partners, sponsoring the Clippers for nine seasons. Another big blow to the Clippers came on Monday when Kia Motors America announced it was suspending its sponsorship of the club over the "offensive and reprehensible" comments allegedly made by Sterling. Kia serves as the official automotive partner of the NBA. It also sponsors TNT's "Inside the NBA." "As fans of the game of basketball, our support of the players and the sport is unwavering," Kia spokesman Scott McKee said in a statement. In an audiotape, a man said to be Sterling tells a woman not to associate with black people. The remarks linked to Sterling were first reported over the weekend by TMZ. Another sponsor that is fleeing is Mercedes-Benz. The luxury automaker's Southern California dealers have a deal with the team that's advertised on the Clippers Web site. Mercedes officials could not be reached for comment Monday. “Mercedes-Benz is obviously concerned about the alleged comments attributed to the Clippers’ owner. We find these comments to be deplorable and completely against the values we promote as an organization," Mercedes-Benz said in a statement. "Our dealer group shares our concern and has moved to cease its sponsorship of the Clippers effective immediately, despite their affinity for the Clippers and their fans." Virgin America and State Farm Insurance have also dropped sponsorships of the team. Seth Burton, a spokesman for the Clippers, said he wasn't aware of any changes with the club's marketing partners. He declined to comment further. Racist remarks or attitudes are the one thing that's sure to make corporate sponsors on Madison Avenue head for the hills, said Mike Paul, president of MGP & Associates PR and an expert on reputation management. That's why it's not surprising why sponsors reacted so quickly to a story that only broke this weekend. "There's a zero tolerance for it," said Paul. "You cannot be associated with anything racist in this country." The NBA and the Clippers are both investigating Sterling. The league plans to hold a press conference Tuesday on the matter, according to spokesman Mike Bass.